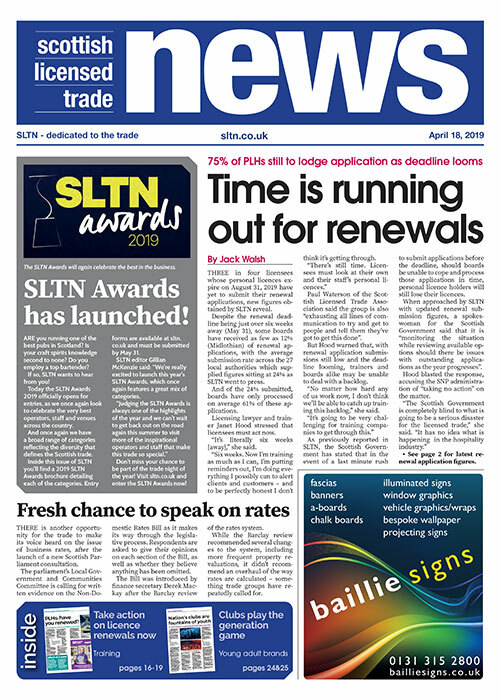 Three in four licensees whose personal licences expire on August 31, 2019 have yet to submit their renewal applications, new figures obtained by SLTN reveal . Michelin Star chef Jeff Bland has been awarded hospitality industry charity HIT Scotland’s Industry Award . Online SCPLH courses and compliance modules go live . Are you running one of the best pubs in Scotland? Is your craft spirits knowledge second to none? Do you employ a top bartender? Time is running out to renew your personal licence, trainers warn . Calls for communication as extension project is approved . Applications are now open for the first Andrew Fairlie Scholarship . Restaurateur went from royalty to community . Catering for the community underpins family hotel business . Irish bar Malones Glasgow puts televised action at the heart of offer .